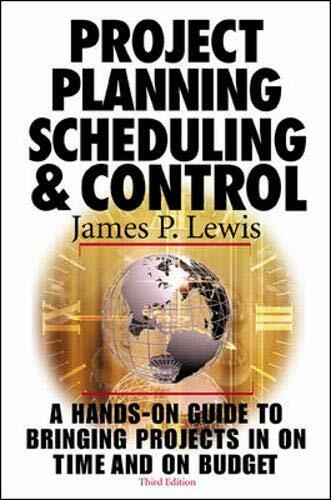 Unique among project management books, Project Planning, Scheduling Control is renowned for its applications-oriented, non-theoretical understanding of the flexibility required in day-to-day management situations. New material in this long-awaited third edition includes easy-to-follow guidelines for managing multiple projects, effective risk management strategies, an innovative blueprint for developing a workable project methodology, and more. Practical, proven, and down-to-earth guidance for effective project management. I only read this book because it was a requirement for a college course. Turns out the book is interesting enough to keep my attention. Large print makes for a quick and easy read. Plenty of diagrams as well. Even non-project managers can find this useful! I'm not a project manager by training, (I've had no formal 'lessons' in the craft,) but I do perform the work of a PM, and this book has been a life-saver at times. It has helped me understand the basics of what I need to do in my current role, and helped me understand what to focus on first to ensure I don't flounder too much. Thank you Mr. Lewis for putting this book together! (I also have your more basic "Fundamentals of Project Management" paperback, also a good buy! I haven't completely read the book yet, but it's been very helpful so far. The book is definitely a page turner and does not get too wrapped up on dry theory. The author rapidly fires through most all of the key topics for project management, often citing experts in the field that you can read to learn more. The author points out that most projects fail because of poor definition. It's unfortunate his book doesn't fully describe how to prevent this, especially when it comes to really connecting to customers and understand what they need out of the project. This might be very obvious if your customers of the project work in your same firm. Of course you may also be the customer of the project. If you're not though, you're going to need more than this book to deliver the *right* product. I am a student in the Project Management Program at Northwestern University, this book will give you the fundamental of Project Management, graphic and explanation are great. This is an excellent book for all project managers. The concepts are presented with lots of examples which makes it easy to read. The chapter on EAV is great!! التعديل الأخير تم بواسطة HaMooooDi; الساعة 02-19-2009, 10:26 PM. جميع الأوقات بتوقيت جرينتش+4. هذه الصفحة أنشئت 08:22 AM.